Japan and the United States build phones differently. In the U.S. we want better performance, more dazzling displays, and faster processors. Japan just makes the thing look awesome. And not many have done it better than Sharp. 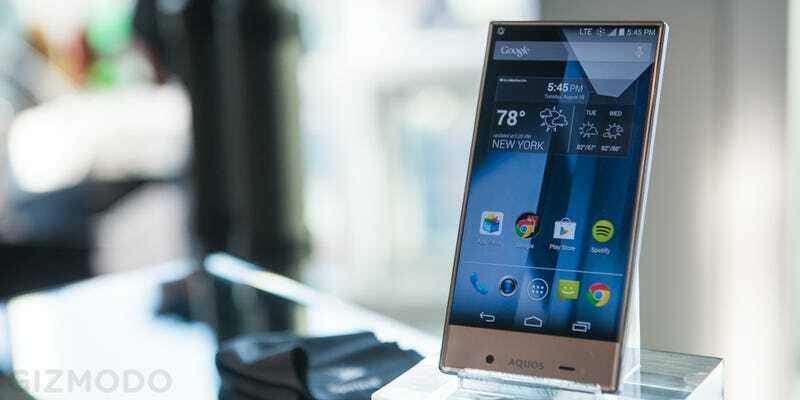 Sharp's new Aquos Crystal is the most recent example of this design philosophy. But this time, this smartphone eye candy won't stay landlocked to its home country; it's coming to Sprint for $240 with no contract. While that price is unexpectedly low, it's not supposed to be the real headturner. That would be the edge-to-edge, 5-inch 720p display. As we've previously mentioned, this smartphone is virtually bezel-less—virtually. There actually is a bit of a bezel around the rim, but it's a stunning sight nonetheless: the screen stretches to the top of the device and seemingly into infinity. The display is undoubtedly the coolest part of this phone. I mean, just look at that thing. As for that missing microphone that's usually chilling up top, a Sharp representative told me they use a direct wave receiver, which actually vibrates the screen next to your ear to transmit sound. No, you don't have to turn the phone upside down to make a call. However, Sharp did put its 2MP front-facing camera on the bottom, so selfies may be a teensie bit more difficult. As for the rest of the device, the back uses a plastic, dimpled material that feels a little cheap but isn't as aggressive as Samsung's Galaxy S5. The Aquos Crystal is pretty comfortable to hold, though the rounded back makes it surprisingly a little thicker than other 5-inch smartphones. The rim of the phone is plastic as well, though it has a metal-like finish. Traversing through the software, I purposefully tried to make accidental touches around the edges to see if the absence of bezel caused usability problems. It never happened once. The Aquos Crystal runs native Android 4.4.2 with a few preinstalled apps, including Clip Now, a fun but somewhat unnecessary app that lets you capture screenshots and generate a sharable URL by swiping across the very top of the device. All that said, this isn't a premium handset, at least not by American consumer standards. This smartphone only packs a Snapdragon 400 processor, 1.5GB of RAM, and a measly 8GB of storage (though a MicroSD slot is available). The camera is just okay. Its 8 megapixel rear-facing camera feels a little too sharp due to either a mediocre lens or mediocre software, but is pretty good on exposure. Of course, these middle-of-the-road guts make a lot of sense when you consider its bargain-basement pricing. It even still comes with Sprint's particular suite of services including Spark LTE—Sprint's tri-band LTE network—and Harmon Kardon audio processing. There's also Apps Pass, which is a different billing approach for Sprint. For $5, this subscription gives you access to "premium" apps. At the demo, these included productivity and gaming apps such as Microsoft Office Suite 7, GT Racing 2, and AccuWeather Platinum. The Apps Pass team hopes to have up to 150 choices when the service launches on August 29th with as many as 300 apps once the service is in full swing. Users also receive $5 every month as in-app credit, essentially nullifying the subscription price. It'll be available for current Sprint users and will be pre-loaded on future devices. Apart from its flashy new addition to its hardware lineup (though the carrier has yet to announce a sale date), Sprint is also taking a bold new stance on pricing. Yesterday, the carrier announced a new family plan that offers double the data than its competitors, giving 20GB of data for four lines for $160, and if you sign up between Aug. 22 and the end of September, that price dips to just $100. If only pricing was Sprint's real problem instead of coverage. This cheap phone and recent aggressive data plan pricing shows that Sprint is making some bold moves under new CEO Marcelo Claure. We'll just have to see if it's enough to make up ground in an increasingly competitive space.